Travis 'Mad Dog' Maddox is a whore. He spends his free time drinking, cage fighting and screwing down any female with a heartbeat that crosses his path. Travis is broken, self loathing and thinks he deserves this lifestyle that he's become accustomed to. Until he meets Abby. Immediately Travis sees Abby as a challenge, she despises him with an open honesty that Travis isn't used to. She's one of a only a few that remain unimpressed by the legendary walking one night stand that is Travis. But he's been told she's off limits, he isn't even Abby's type. The two form a strange, destructive and volatile friendship. Abby is emotionally unstable, and Travis is violent and possessive, but together they seem like just what the other one needs. 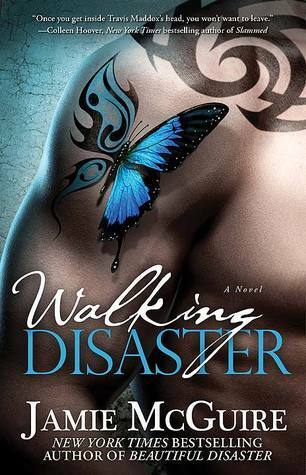 This is the companion novel to Beautiful Disaster, as told from the viewpoint of Travis, the male protagonist. I wasn't particularly thrilled when Reading Beautiful Disaster, as I couldn't see past the behavior of Travis, setting back women's rights by decades. For a fleeting moment when reading the opening chapter about Travis as a boy losing his mother, left me feeling slightly guilty, that perhaps the story from his point of view might give readers a better understanding of what makes Travis tick... But no. Once you start reliving his relentless pursuit of Abby, his violent and possessive outbursts, I can't understand how any woman could find that remotely attractive. Any man who insists on owning you like a possession, treating you as if you were a plaything or an conquest, should have his testicles sliced from his body. It is not endearing, it's not romantic, it's psychotic. I like Jamie McGuire's style of writing, it flows easily and the characters dialogue is realistic, but I loathe Travis Maddox with a passion that I typically reserve for people who are cruel to animals, door knockers trying to convince me to switch power providers and North Korean dictators.